Having a website that is mobile friendly and responsive comes at no extra cost at Creative 7 Designs. When we design a website for you, we intend it to be usable to your clients and factor in that 80% of all website visits today come from mobile phones and tablet devices. That means that if your website isn’t responsive, you aren’t even reaching 20% of your possible traffic. We’ll explain the math: being mobile friendly improves your ranking with Google. If Google sees that you don’t have a responsive website, it will show every other mobile-friendly site before yours and exclude your site from mobile searches entirely. Add to that equation every advertising business that pays to outrank you, and that “less than” 20% suddenly becomes significantly <20%. Luckily, this isn’t something you need to worry about using our Website Design Services. Since it’s early days and far before it was common to do so, we implemented responsive design on our websites and currently continue to look to the future in all work we produce. If we think something up and coming will be beneficial to you, we will recommend it. If we think a web design or usage trend is going to change one way or the other, we find the facts to back up our opinions and make adjustments accordingly. When what works changes, we adjust what we do. We stay responsive, regardless. 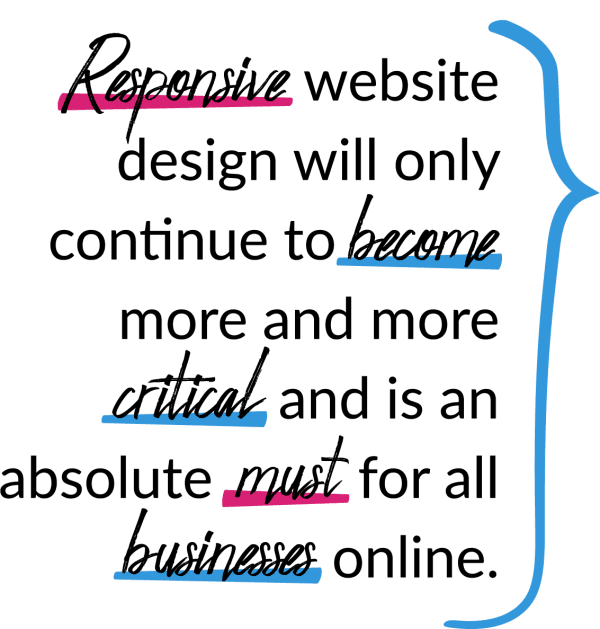 Responsive website design will only continue to become more and more critical and is an absolute must for all businesses online. If you are interested in starting a website project, or if you have a site that is not responsive, contact us about our Website Services today or fill out the form on this page! We are happy to start from the ground up (even if that means branding you first!) or redesign what you currently have in place. Check out some of our recent web design work; all made to each client’s specifications.